Vicky Man is currently an undergraduate Archaeology student. She dug at Basing House in 2013, and is now coming into her third year at the University of Southampton. Vicky has been working on her major project since the beginning of the summer and spent the field season this year with us at Basing House collecting data for her research and working with staff and volunteers to think about how to tackle her fascinating topic. Vicky has written a blog post introducing her research. 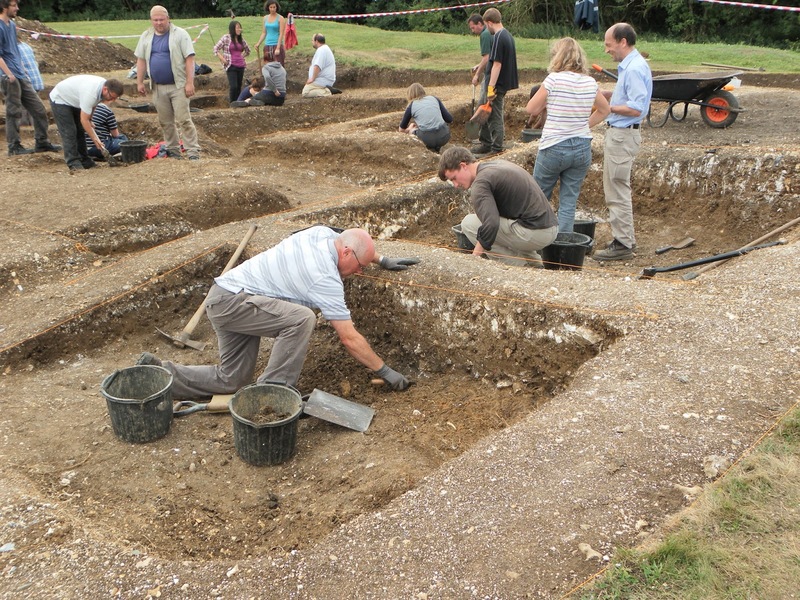 The Basing House team have been recording small finds from the 2014 season using the technique that Vicky outlines below. Last year, in fact we used RTI to help with the interpretation of the Roman coins that we found (see this great blog post by Phoebe). This year, we are using the technique to record a selection of objects, and we are hoping the technique will answer specific questions. Look out for future blog posts on these findings. We will also write a blog post soon describing this technique to you. Because RTI uses open source software it is a low cost option for recording similar artefacts, with the only expense being a digital SLR camera. In the meantime, you can check the Re-Reading the British Memorial Project. 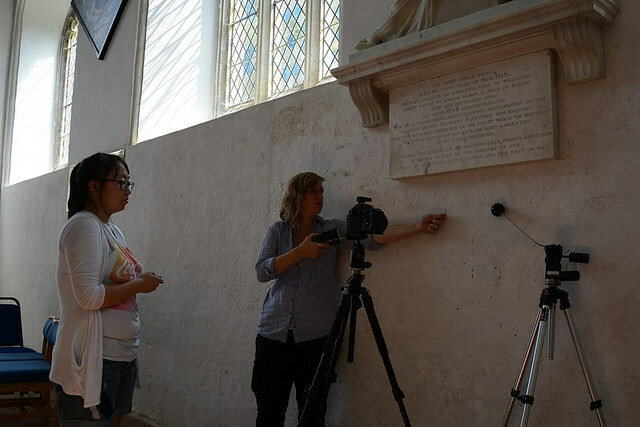 This is a project directed by Gareth and me; we train special interest community groups to use RTI to record church memorials and so much of the guidance for the technique is available through the project website. We can’t wait to see some of the results. Rest assured, we will be asking Vicky to write a follow-up blog post on her findings later in the year! Thank-you to Vicky for this excellent blog post! It was always going to be a daunting process, finding a suitable dissertation topic for my third and final undergraduate year. The fact that my time at university had flown past was astonishing enough, let alone the fact that I had to find something of interest to do a dissertation on! It was lucky then, a couple of things caught my attention, during my time at Basing House 2013. First, it was an introduction to RTI (which will be talked about more), a digital form of recording used in archaeology, that I didn’t even know existed prior to this dig! Second, it was a visit to St Mary’s Church (incidentally down the road from the Basing House site) on a rainy day. I knew I wanted to use RTI, so it naturally led me to use St Mary’s Church as a case study. But what would I be recording? 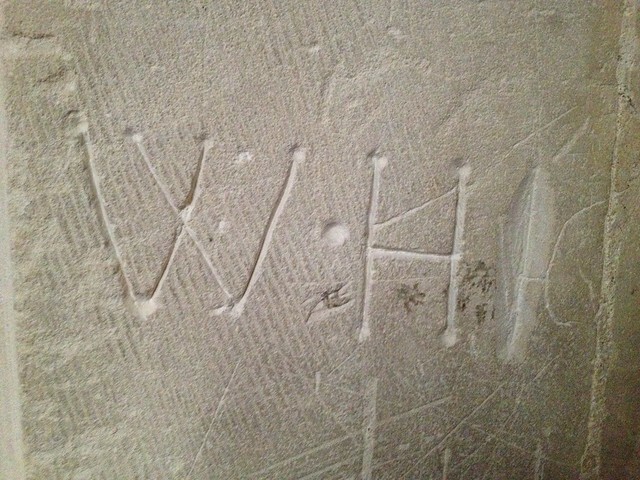 After a couple of visits to the church, it was apparent that graffiti was scattered all over the church interior. Therefore, I decided to investigate the use of RTI on church graffiti present there. What is RTI? And graffiti…? RTI stands for ‘Reflectance Transformation Imaging’, a computational photographic technique that records the surface, holds the potential to uncover details that is hard to see by the naked eye. 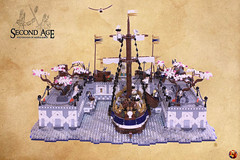 In order to form the final RTI image, a series of images are used. 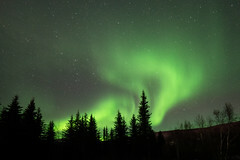 The photos are taken from a fixed point. What differs in each photo is where the light source is directed from; in this case, a camera flash is used. This form of RTI is called Highlight RTI. The flash is systematically moved around the object to form an imaginary ‘dome’ shape. 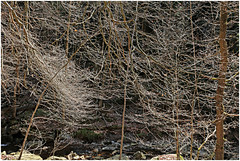 As a result, each photo will vary in highlights and shadows that will show in the final photo. Graffiti is often described negatively nowadays; however, what sets graffiti found today apart from graffiti found in the past, is not only the artistic style, but also the meaning behind them. There is of course similarity perhaps in the human need to be remembered, therefore we inscribe ourselves in pieces such as literature in hope that we will be remember once we are long gone. However, what makes graffiti interesting in a church setting is because of the time and effort it must have taken to inscribe onto the hard walls. The set-up for a Highlight RTI. Vicky is holding the lightsource, which is triggered remotely in time with the camera. The reflective sphere captures each light highlight so that the software can patch together all of the photographs in an interactive file. A tiny snapshot of some of the graffiti from St. Mary’s Church. Before getting to the actual recording, I practiced the technique by recording a few artefacts (thanks to the lovely Jude for providing a few artefacts to record!). There were a few technical hitches, getting used to the equipment, but I got there in the end, successfully recording all the material I needed for my dissertation. 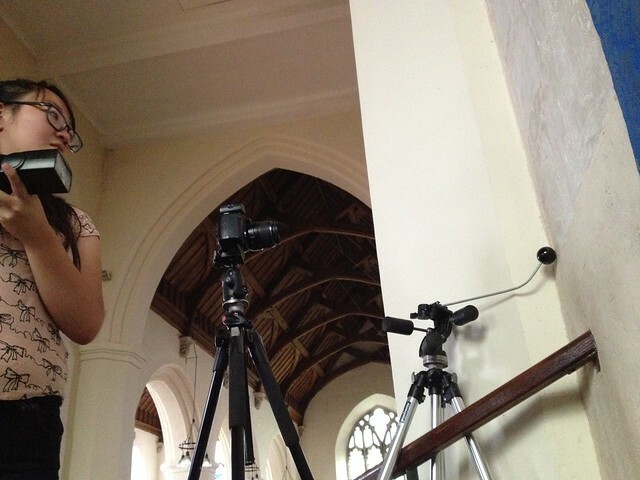 Nicole and Vicky recording in St. Mary’s Church. Photo by Juliette Bijoux. 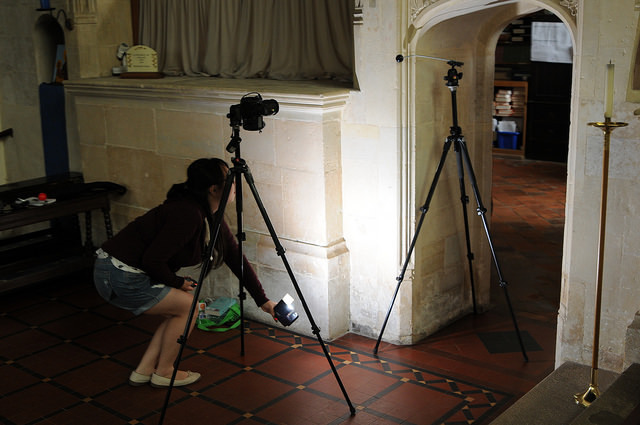 Vicky working on recording some of the harder to get to graffiti in St. Mary’s Church. How can we tell it is even graffiti and not damage? When was it made? What is the meaning behind this symbol? These are just the few questions that arise. RTI is a great technique to use as part of my investigation into graffiti at the church. Now what’s left is answering why. A massive thank-you to Nicole, Gareth, Yvonne, Jude, Chris, Peter, Phoebe and Rev. Alec Battey for kindly supporting me in my dissertation work.